When Jeremiah called for Judah to repent, his proclamation was negated by the prophets and priests who told the people not to worry, mistakenly believing that since the temple was located in Jerusalem, God would certainly not allow it to be destroyed. God revealed the catastrophic destruction that occurred prior to the creation of Adam and Eve and yet He was willing to pardon the people of Judah if just one righteous person could be found in Jerusalem. 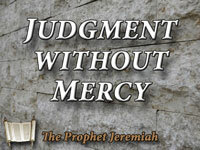 Sadly, there was nothing but deception among the people and Jeremiah summarized them as being without understanding. Why would God pardon them when they wallowed in sin? The entire political system in Judah had become corrupt and dishonest businessmen had become rich oppressing the poor. The prophets spoke lies and the priests were corrupt. Why would the Lord save Judah from destruction when they blatantly ignored Him? The thick walls of Jerusalem would be destroyed and the city would be put to fire as a reminder to the people of their rebellion. The nation of Judah never repented as a whole but certain individuals were blessed when they sought the Lord and were used by Him.